My name is Lily and along with my mother Lulu and my sister Lucy, we’re all looking for lasting love after our previous family surrendered us to the Emmet County Animal Shelter. 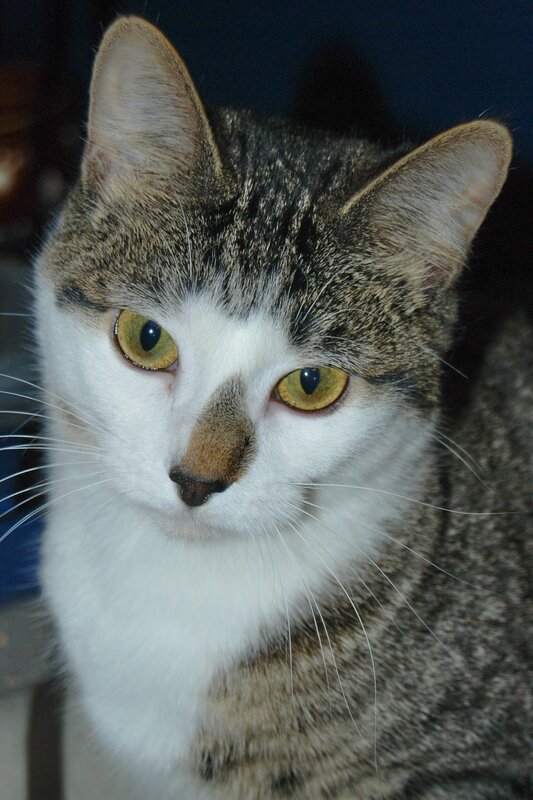 Right around 1-year of age, my sister Lucy and I are domestic short haired girls with exquisite brown tabby patches marking our white coats. And if you want to talk about gorgeous, you should see our mother! She has a fluffy coat of long black and white fur and is the super model of our little feline family. At 2-years of age, my mother is also a very young cat. Cats can get pregnant as an adolescent, so that is why my dear human friends that you should listen to little ol’ me and help fix rather than be part of the pet overpopulation problem. Two unaltered cats can quickly become 2,000. How you ask? Well, 2 healthy cats can produce 2 litters per year. Statistics from Spay USA say that the average survival rate of feral cats is 2.8 kittens per litter. Continued breeding will produce 12 cats the first year, 66 cats the second year and 2,201 cats by the third year. With statistics like that, do you now understand just how important spaying and neutering is? Clearly, some of you require more persuasion! Here goes. Did you know that spaying and neutering also helps with noise control? Sure does. Have you heard cats fighting, yowling and shrieking outdoors? If they were fixed (uh hum, and living INDOORS) you would not be hearing the call of the wild. Not only will spaying and neutering help with noise pollution, it will also help eliminate bad behavior like spraying in male cats, male dogs hiking their legs and will make for a calmer, more peaceful pet. Fixing your pets not only prevents unwanted litters from crowding already overburdened animal shelters, it also prevents certain types of cancer that are much more common in intact animals. If you could spare your 4-legged family member from cancer, wouldn’t you do the right thing? Let’s recap! Fixing your pets helps cut down on the number of abused, neglected and homeless pets. It also makes for a healthier, calmer, quieter and happier furry friend. So, the question is WHY are you waiting? Contact your local veterinarian and help prevent animals, like me, from ending up homeless. I’d much rather be chasing imaginary mice or napping in a sun-filled window rather than lecturing you like I’m Bob Barker! 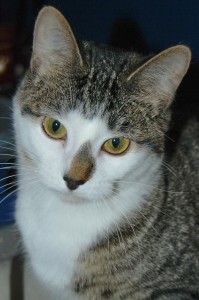 Lily is my name and I’m a spunky and spirited little kitty bounding with playful energy and personality. I enjoy attention and am great with people of all ages and other kitties. I’m in the market for an indoor home where I can bird watch from the back of the sofa, impress you with my gymnastic abilities and plop down on your lap for some quality time each and every evening. Litter box trained, vaccinated and SPAYED…I’m more than ready for my adoption dreams to come true. DON’T LITTER! Let’s get your pets fixed. People!